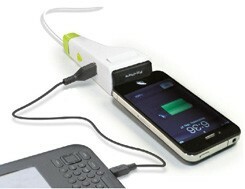 You won't have a difficult time hunting down a charger these days, but hunting down a good one? Now that's a challenge. If you're looking for something that's off of the beaten path (and shamelessly fond of Ma Earth), Idapt's new i1 Eco may be precisely what the doctor ordered. It's a universal charger with two points of charger: a USB port and a tip port, the latter of which is useful for "over 4,000 gadgets" include the iPad, iPhone, PSP, your Xbox 360 controller and your GPS unit. It features an auto-off system that disables it when not in use, and a restart button kicks things back into gear when the time comes. It's slated to ship this spring, but only heaven knows for how much.